Popular historic sites such as Eden Gardens State Park and Falling Waters State Park are in your itinerary. Do some cultural sightseeing at Panama City Beach Winery and Air Force Armament Museum. Venture out of the city with trips to Seaside (Sundog Books & Seaside Beach), Crooked River Lighthouse (in Carrabelle) and Apalachicola National Forest (in Tallahassee). Plan for a day of cool, family-friendly fun on the 8th (Tue) at Shipwreck Island Waterpark. The adventure continues: immerse yourself in nature at St. Andrews State Park, enjoy the sand and surf at Grayton Beach State Park, see some colorful creatures with a scuba or snorkeling tour, and tour the pleasant surroundings at Henderson Beach State Park. 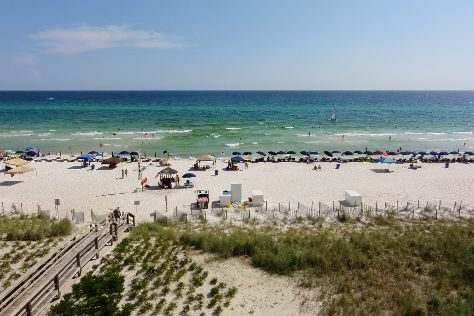 To find more things to do, photos, reviews, and other tourist information, go to the Panama City Beach travel itinerary creator. Expect a daytime high around 90°F in July, and nighttime lows around 74°F. Cap off your sightseeing on the 26th (Sat) early enough to travel back home.